A north-east Tory MP was removed from an exclusive Westminster bar by police following allegations of “sexual touching”. 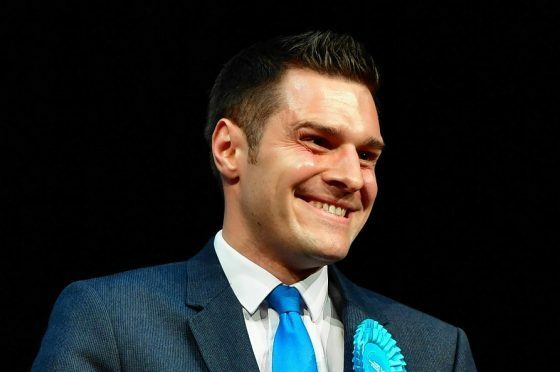 Officers from the Metropolitan Police swooped on Strangers Bar on the parliamentary estate at around 11pm on Tuesday with Ross Thomson, who represents Aberdeen South, invited to leave. It is understood that three men, including the 31-year-old MP, were involved in the incident. No formal complaint was made to the officers, and there were no arrests, but Mr Thomson was last night under pressure to explain his actions. A Metropolitan Police spokesman said: “Police were called at approximately 11pm on February 5 to a bar within the Palace of Westminster following a report of sexual touching. “Officers attended and spoke to the parties involved – three men in their 20s and 30s. A spokesman for the Scottish Tories said that the party was aware of the matter and was investigating. A source close to Mr Thomson said that he would not be commenting on the matter. Mr Thomson was one of 12 Tories elected to the Commons from Scotland in 2017. He was criticised last year after posing for photos at Saddam Hussein’s old military parade ground on a trip to Baghdad and mocked after a television crew tricked him into believing a fake drug app exists that supports fictional children working in a Colombian cartel’s “cocaine factory”. The incident in Strangers Bar comes despite a concerted bid by House of Commons authorities to introduce a stricter regime at late-night pubs in Westminster. This month, in a bid to clampdown on bad behaviour, Commons officials began monitoring drinking in the Palace of Westminster more closely. Alcohol is now only served only from designated bars and restaurants, including the Strangers’ Bar. MPs were told to avoid after-hours drinking parties in their offices and to go home after Parliament’s pubs close.